One of the original site map renderings for the Confluence Project. 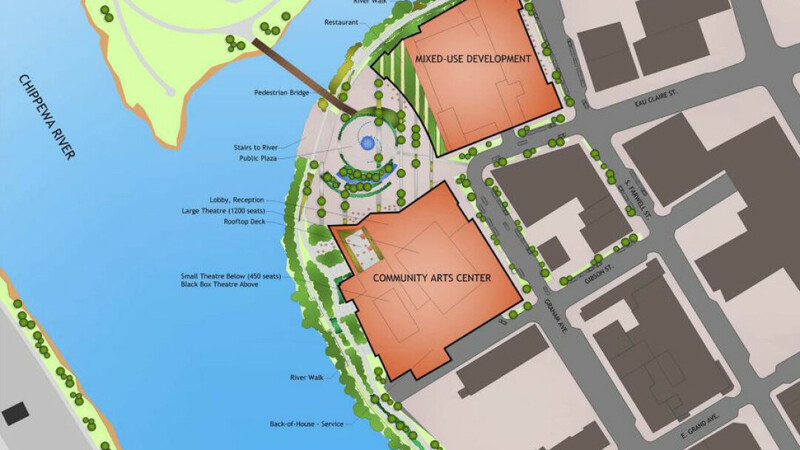 Eau Claire-based Commonweal Development is donating $100,000 toward the proposed Confluence Project performing arts center, making it the latest Chippewa Valley business to pledge support for the transformative downtown Eau Claire effort. Commonweal has been a major partner in the multi-building public-private project since the beginning: The commercial real estate firm is one of the partners in the privately funded Haymarket Landing building, which is under construction on South Barstow Street. The $40 million arts center will be funded with a combination of donor dollars and public funds. In addition to the $13.5 million fundraising goal, funds have been pledged by the city and county of Eau Claire. Gov. Scott Walker also included $15 million for the project in his version of the 2015-17 state budget, but that money still must be approved by the state Legislature. The state funding is contingent on a local match – which is one of the reasons philanthropy is so important.